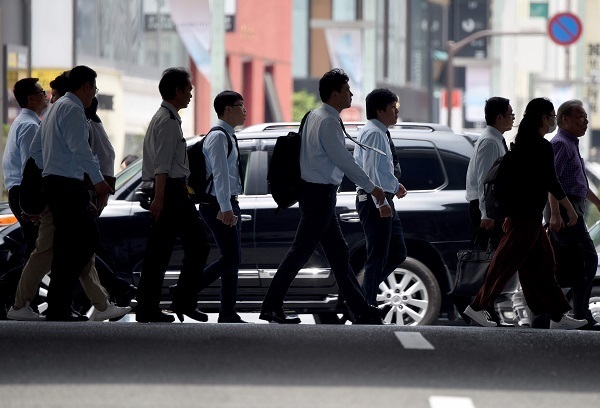 TOKYO (AFP) -- Japanese employers are scrambling to find staff, unemployment is at its lowest level in more than two decades and the labor market is tighter than it was during Japan’s booming bubble economy years. This should be great news for the world’s No. 3 economy, but analysts are warning not to pop the champagne quite yet because it is mostly due to a shrinking labor force. And many jobs are temporary and pay very little. Japan tied with Iceland in 2016 for the lowest annual unemployment rate -- 3.1 percent -- among 35 member nations of the Organization for Economic Cooperation and Development. This week Japanese government figures showed the jobless rate at 2.8 percent in April for the third consecutive month and the lowest since 1994. Another key labor market measurement -- the ratio of job offers to job seekers -- hit 1.48, meaning there were 148 positions available for every 100 job hunters. This is the strongest level in 43 years and is higher than before Japan’s once-booming economy collapsed from a stock and real estate price bubble in the early nineties. Prime Minister Shinzo Abe may claim Japan’s employment picture as a win for his Abenomics growth policy -- the jobless rate was 4.4 percent in 2012, the year he swept to power on a ticket to reignite the laggard economy. But analysts are not convinced. “Low unemployment is not an achievement of Abenomics,” said Ivan Tselichtchev, an economics professor at Japan’s University of Niigata. “It is a structural phenomenon and, unlike most other developed countries it looks quite independent, or autonomous from the business cycle and economic growth rates. Examples of labor shortages are everywhere in Japan these days. Some 24 restaurants are cutting back their hours because they do not have enough staff, while delivery service Yamato has been forced to trim services citing to a lack of drivers. A lack of formal immigration is part of the story. Bringing in foreign workers is a tough sell politically so Tokyo has focused on luring even more seniors and women into the workforce -- many women quit jobs after marrying. But Japan’s population is expected to fall by almost a quarter between 2010 and 2050 to below 100 million. And over-65 seniors are set to make up almost 40 percent of the population from 26 percent in 2015, the highest in the OECD. This is a worrying demographic picture for the labor market. “Japan faces increasing labor shortages in the face of a falling working-age population,” said Randall Jones, head of the OECD’s Japan/Korea desk. Staff shortages have translated into higher wages in certain sectors, but the broader impact has been more limited. In March, some of Japan’s top companies including Toyota and Panasonic announced their lowest wage hikes in years. That has frustrated the Bank of Japan’s efforts to boost prices and hit a 2 percent inflation target, seen as key to putting Japan’s economy on a solid path. Low employee productivity is another issue. Visitors are often shocked by the sheer number of workers in Japan’s service sector, many with seemingly little to do. “The number of employees is excessive by Western standards because Japanese customers like face-to-face service,” Tselichtchev said. Still, a lower unemployment rate would seem to be a plus for prosperity, but the quality of positions is also changing. The jobs-for-life mentality credited for Japan’s sharp post-war economic growth has given way to more precarious contract jobs, usually with lower pay. “Companies are dramatically increasing the share of non-regular workers,” Tselichtchev said. Non-regular jobs -- the majority filled by women -- rose sharply to 37.5 percent of overall employment last year from 20.3 percent in 1994. This does little to inspire people to have kids or spend their yen. “It would be better for the economy if I spent more, but I honestly can’t,” said one young woman, who now works on a temporary contract.